Industry Profile | Brazil Energy S.A.
As an essential input for the most diversified segments of the Brazilian economy, from domestic consumption and public lighting to the operation of industrial, commercial and transport activities, power consumption is directly related with the growth of a country. As a general rule, the higher is the GDP per Capita of a country, the higher will be the purchasing power of every inhabitant and the higher will be the individual demand for power. According to data provided by the Ministry of Mines and Energy, the power consumption per capita in Brazil is expected to grow by approximately 45% from the current figures, reaching 3,561 kWh/year by 2020. To sustain the expected economic growth, it is estimated that Brazil will require investments above R$ 380 billion in the power generation industry until 2022. The increase of the installed capacity should occur not only for meeting the future demand for power, but also for increasing the system safety. The installed power generation capacity in Brazil is 116.5 GW, with significant concentration in hydroelectric sources (70%). 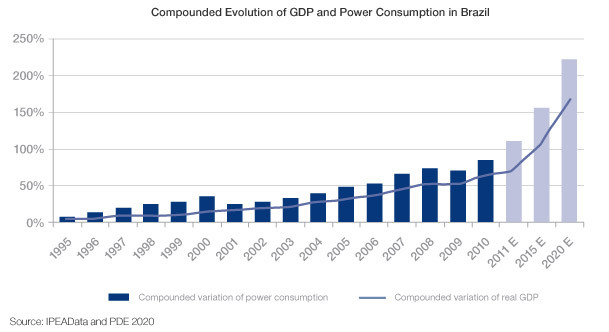 The diversification of the Brazilian power matrix is a strategic need for Brazil. A diversified electrical matrix mitigates the risks inherent to each source, thus increasing the complementariness and reducing the uncertainties in generation. In parallel, there is a strong trend worldwide for meeting the increase of demand for power more and more by renewable sources, such as hydroelectricity, biomass, wind and solar power. Several countries are committed to reduce their carbon emissions in the future and many technologies are evolving to replace the energy production based on fossil fuels by sources that do not harm the environment. Therefore, it is reasonable to consider that most of the increase in the installed capacity will derive from renewable sources. Today, the concern with the environment is essential in the analysis of infrastructure investments in several countries in the world. 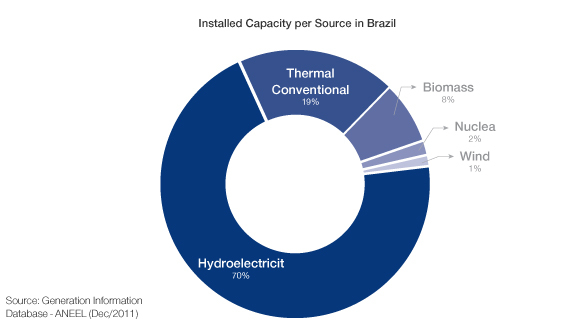 Within this context, we may highlight in Brazil the high growth of wind power occurring in the last few years, the huge hydroelectric potential to be explored by Small-Sized Hydroelectric Power Plants (PCHs) and the profusion of biomass not yet used for power generation.